This paper introduces Structured Grammatical Evolution, a new genotypic representation for Grammatical Evolution, where each gene is explicitly linked to a non-terminal of the grammar being used. This one-to-one correspondence ensures that the modification of a gene does not affect the derivation options of other non-terminals, thereby increasing locality. The performance of the new representation is accessed on a set of benchmark problems. 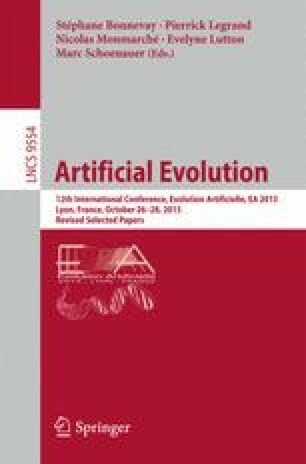 The results obtained confirm the effectiveness of the proposed approach, as it is able to outperform standard grammatical evolution on all selected optimization problems. This work was partially supported by Fundação para a Ciência e Tecnologia (FCT), Portugal, under the grant SFRH/BD/79649/2011.